After working all week you want to use your limited leisure time for having fun in your game room, not driving all over town shopping for game room furniture. Fairview Game Rooms can help! We ship for free, so enjoy selecting exactly what you want and have it shipped to your door rapidly from our Springfield, MO warehouse. Our quality furniture selection will allow you to add the perfect pieces to your game room. 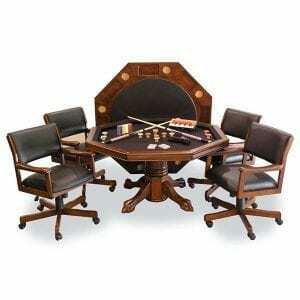 Are you looking to add to your billiard furniture collection? Let us help you get the quality items you need for a casual game or for when you invite the gang over. 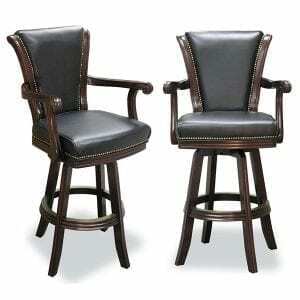 Start with a fantastic billiard chair like the Signature Billiard Chair For Two. This is a quality chair upholstered in durable faux leather. Rest your cue and your drink in the arm of the chair and sit back; there’s plenty of room in this chair for you and a pal. 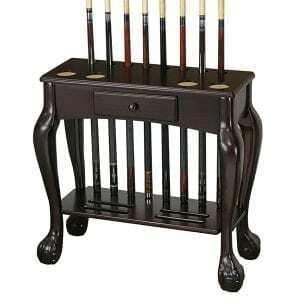 Continue expanding your billiard furnishings with one or more of our cue racks. Whether you desire a wall mounted rack, a rack with a drawer for your billiard accessories or one of our traditional or corner billiard stands, your cues will always be at the ready. One of the best reasons to shop with Fairview Game Rooms is our selection. Whether you are interested in billiard chairs or cue racks, or want to add some additional items like bars, barstools, accessory chests, pub tables, or even a foosball or shuffleboard table, Fairview Game Rooms provides you with a selection that is unrivaled for quality and value. 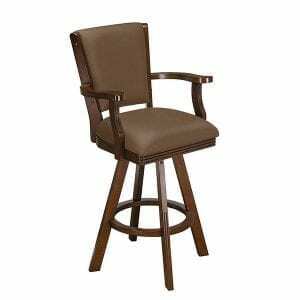 We invite you to shop for more items within our Signature Series and our Executive Series game room furniture categories. These are furnishings of the highest quality that can provide a touch of class and comfort for any game room. Plus remember we offer free shipping right to your home. As you can see Fairview Game rooms can help you set up an entire game room or help you purchase the perfect complements to your existing game room furniture. 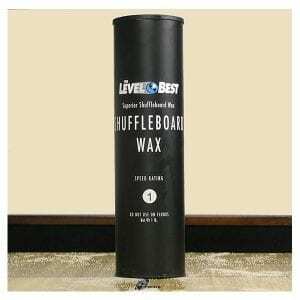 Our site is designed to make shopping for game room furnishings easy and our exceptional customer service and free shipping make shopping a pleasure. Get ready to turn your home into the go-to place for gaming in your neighborhood! Fairview Game Rooms has the billiard furniture and accessories to make it happen.